TOWCESTER TAXI AIRPORT TRANSFERS 01908 263263 RELIABLE ROAD TAXI TRANSPORT: Memo To Mike 'On Side' Brown And Sadiq Khan....If NYC Can Do It, So Can't You ??? Memo To Mike 'On Side' Brown And Sadiq Khan....If NYC Can Do It, So Can't You ??? 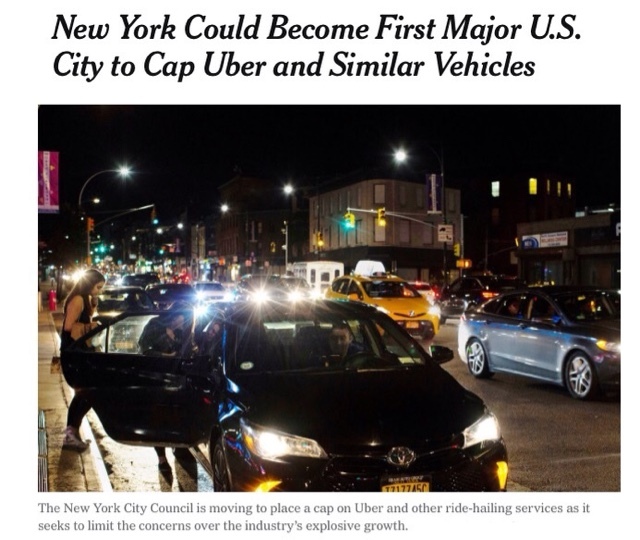 New York City officials are moving to cap the number of vehicles driving for Uber and other ride-hailing services as part of an aggressive move to address mounting concerns that their explosive growth has led to worsening congestion and low driver wages. The legislation being considered by the City Council would make New York the first major American city to set a limit on ride-hailing vehicles, which in a relatively short period of time have transformed the transportation networks in cities across the world. Mayor Bill de Blasio, while stopping short of fully endorsing the proposal, suggested that the time had come to rein in the industry. The proposal supported by the City Council speaker, Corey Johnson, would halt the issuance of new for-hire vehicle licenses, except for vehicles that are wheelchair accessible, while the city conducts a yearlong study of the industry. It is the second attempt by New York City — Uber’s largest United States market — to cap the company’s vehicles after a failed effort by Mr. de Blasio in 2015. Since then, the number of for-hire vehicles in the city has surged, rising to more than 100,000 vehicles, from about 63,000 in 2015, according to the city. Mr. de Blasio, Mr. Johnson and other elected officials have raised concerns about the decimation of the once-thriving taxi industry and the increasing gridlock on city streets. Questions over the impact of ride-hailing services have also become more visceral: Six professional drivers have killed themselves in recent months, including three taxi drivers. New York’s strong stance toward Uber comes at a time when other cities are grappling with how to respond to the challenges posed by the remarkable rise of ride-hail apps. Last month, Uber won back its license to operate in London after agreeing to stricter regulations. A series of proposals before the City Council — all seeking to tackle problems in the industry — would also move to set minimum pay rules for app drivers, a step that would make New York the first major American city to establish a pay minimum for drivers. The City Council could vote on the measures as soon as Aug. 8. Mr. Johnson, a Democrat who became City Council speaker in January, said that it was clear that something needed to be done to grapple with the disruption in the taxi and for-hire vehicle industry. Uber, setting the stage for what could be another fierce fight, immediately blasted the proposal, arguing that it would hurt its customers, especially those who live in the boroughs outside Manhattan, where the growth of ride-hailing services in neighborhoods ill served by public transit helped them achieve a milestone and surpass yellow cabs in the number of daily riders. Mr. de Blasio’s office worked with the City Council on the proposals and Eric Phillips, a spokesman for the mayor, said City Hall would monitor the legislation and hoped that it would help drivers and decrease congestion. “The mayor was out front on this issue when few people were,” Mr. Phillips said in a statement. “He is pleased it’s getting the attention it deserves from the Council.” Any bill passed by the Council to regulate ride-hailing services would have to be signed by Mr. de Blasio before taking effect. This week, transit officials said the popularity of Uber and other ride-hail apps had been a factor in the continuing decline in subway and bus ridership. But some transit advocates say the main reason riders are abandoning the subway and bus system is because of terrible service: Uber is just offering an attractive alternative. The City Council is also moving to regulate Airbnb, another tech company that has upended a long established industry — in this case, hotels. Uber’s leaders have signaled that they were open to discussing new regulations, but they have adamantly opposed any cap. On Thursday, as city officials began to discuss the cap, Uber released a new ad to oppose the proposal. The ad focused on the difficulty some New Yorkers — particularly people of color — face in hailing a taxi. It shows vehicles vanishing from the app. “If the New York City Council gets its way, all of this could disappear,” the ad says. Mr. de Blasio, a Democrat in his second term, engaged in a bruising battle with Uber during the 2015 debate over a cap. The company introduced an app feature, known as “de Blasio view,” that showed riders lengthy projected wait times if a cap was approved. But Uber’s reputation has taken a hit in the years since it successfully fended off the mayor. The company was rocked by accusations of gender discrimination and harassment in its workplace, and its founder resigned last year. Still, Uber and other apps like Lyft are popular in New York. The City Council’s legislative package would change the way these apps operate, licensing companies that provide more than 10,000 daily trips as high-volume transportation services with separate regulations. Under the bills, city officials could also set standards for how often a vehicle must be occupied by a passenger, to reduce the time spent driving around the city while empty. Mr. Johnson’s office said that it hoped the proposals would push companies to add more wheelchair-accessible vehicles — a longstanding problem in the industry.